If you’re like most people, when you hear the word “cheeseburger,” images of American cheese, yellow mustard, dill pickles, and a sesame seed come to mind. And this cheeseburger casserole recipe has all the taste of your favorite burger, with a fraction of the carbohydrates. Plus, you’ll get an entire family size meal in just one casserole dish. Plus, there’s cream cheese involved — and who doesn’t love cream cheese? 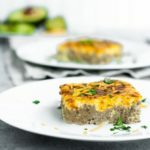 If you’re feeling adventurous, you can even make this a bacon cheeseburger casserole by adding keto-friendly bacon on top. Casseroles are traditional American comfort food, and cheeseburgers are a fan favorite in every household, so you really can’t go wrong with this one. The benefits of garlic seem to be endless; this powerful natural ingredient delivers a wide array of benefits, including heart health. Garlic in large amounts may help prevent heart disease and may also help reverse some of the markers associated with heart disease[*]. Studies show that garlic helps to reduce blood pressure and also balance out your blood lipids, which can ultimately contribute to atherosclerotic plaques — a leading factor in heart disease and stroke[*][*][*][*]. Black pepper is a spice that doesn’t usually get much credit for its health benefits. Although you’re only using a small amount of black pepper in this recipe, you can add black pepper to almost any savory meal you cook. And why should you? Research shows that black pepper contains antioxidants that may benefit your heart, as well as help protect against type 2 diabetes[*]. Buying grass-fed and (hopefully) grass-finished beef is essential to the nutrient-density of your meal. Grass-fed beef is higher in several nutrients, including CLA (conjugated linoleic acid)[*]. CLA is known best for sustainable weight loss, but it’s also shown to protect against certain cancers in some research[*]. In one study, researchers found an inverse association between the risk of breast cancer in women and their dietary and serum CLA content[*]. Garlic has also been shown to support your immune defenses. It contains powerful antibacterial properties and sulfur compounds that may reduce the risk of stomach, colon, pancreas, and breast cancers, to name a few. The National Cancer Institute has even officially recognized garlic’s impact on strengthening the immune system[*][*][*][*][*]. Garlic is particularly rich in antioxidants. In addition to reducing oxidative stress in your cardiovascular system, the antioxidants in garlic may also help prevent cognitive diseases like Alzheimer’s and dementia[*]. The lutein and zeaxanthin in eggs deliver antioxidant support to your eyes and are well researched for their role in protecting you from diseases like macular degeneration and cataracts[*][*][*]. This casserole is the perfect addition to your weekly meal plan and you can even prep it ahead of time for a simple, hassle-free meal for your busy week. So put on your favorite podcast, preheat your oven to 375 degrees Fahrenheit, and let’s get started. Take your casserole dish, grease it, and set it aside. Then place a large pan or large skillet onto your stove over medium heat. Add in the garlic and saute it until it becomes fragrant, which usually takes a couple of minutes. Add in your grass-fed ground beef and cook until brown. Drain the excess liquid and grease into a glass dish for disposal. Then, add your cream cheese, salt, and pepper. Once you’ve combined those ingredients into your pan, stir them until the cream cheese has fully melted, and transfer the mixture to your greased baking dish. Grab a mixing bowl and add your eggs, heavy whipping cream, mustard, and 1 cup of your shredded cheddar cheese. Use an electric mixer and mix it on medium-high until it’s thoroughly combined, then pour the egg mixture on top of the beef mixture that’s already in your casserole dish. Top it off with the remaining shredded cheddar cheese. Place the casserole dish into the oven, baking until the edges are golden brown, which will take about 15-18 minutes. Once the sides are nice and golden, broil the casserole for 2 minutes then remove it from the oven, allowing it to cool for a few minutes. This cheeseburger casserole will quickly become one of your favorite recipes. It goes perfect with a side salad, and if you’re really feeling the cheeseburger vibe, throw some diced tomatoes and diced pickles on top. This cheeseburger casserole is the ultimate low-carb meal! It’s easy to make, ready in under an hour, and a keto-friendly dish the whole family will enjoy! Preheat oven to 375°F then spray the casserole dish with non-stick cooking spray or grease with butter. In a large pan over medium heat, saute garlic until fragrant. Add ground beef and cook until browned. Drain excess grease before adding cream cheese, salt, and pepper to pan. Stir until combined and cream cheese has melted — transfer meat mixture to prepared casserole dish. To a mixing bowl, add eggs, heavy whipping cream, 1 cup shredded cheddar cheese, and mustard and mix with electric mixer until thoroughly combined. Pour egg mixture on top of beef in the casserole dish — top with remaining ½ cup shredded cheddar cheese. Bake until edges are golden brown — about 15-18 minutes, then turn on oven broil for 2 minutes. Remove dish from oven and allow to cool before cutting and serving.